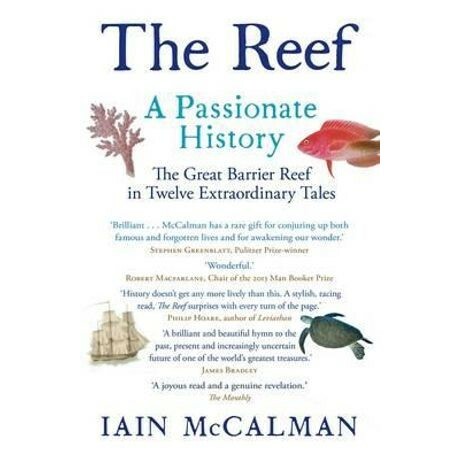 The Great Barrier Reef, argues Iain McCalman, has been created by human minds as well as coral polyps, by imaginations as well as natural processes. In this landmark book he charts our shifting perceptions of it, from the terrifying labyrinth that almost sunk Cook's Endeavour to a fragile global treasure. The Reef describes twelve key encounters between people, places, ideas and biosystems. In the nineteenth century the region was infamous for shipwrecks, and when Indigenous clans rescued survivors like Eliza Fraser, their actions were misrepresented in the popular press. Later, the whole world caught the fiery debate between Darwinists and creationists over the origins of this colossal structure. Artists and visionaries celebrated its beauty and fought its exploitation; marine scientists catalogued the threats to its existence. The first social, cultural and environmental history of this World Heritage-listed site, The Reef is an effortlessly readable work by a born storyteller. Iain McCalman was born in Nyasaland (now Malawi) in Africa in 1947. Although a third-generation African - his family is descended in part from Australians who fought with the Australian Light Horse in the Boer War - McCalman grew up knowing he would eventually have to leave Africa. His father, a Kenyan-raised British civil servant, "was very liberal for his time", says McCalman. "He always told us European colonials were caretakers, not owners, and we'd have to go one day. It really irritated my sister and me. Africa was our home. But he never bought property, always prepared us to leave."